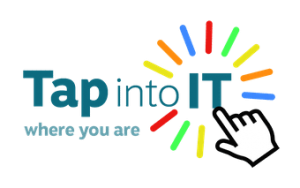 Volunteering in the third sector with Tap Into IT - volunteer now! Are you keen to help folk get online and make more effective use of the internet and ‘tech’? At Tap into IT Where You Are, we believe that everyone should be able to enjoy the benefits of the internet and technology. ‘Digital literacy’ can make as big a difference to quality of life today as was made by teaching everyone to read and write a century or so ago. If you would like to become one of the 27% (19,500 people) that volunteer in the third sector in Edinburgh annually, then why not join us? Tap into It Where You Are runs clubs ‘where people are’ – Sheltered Housing, Residential Care homes, Community Centres and group/organisation/church premises as well as individual’s own homes. Primarily we are working with ‘older’ people from around retirement age and beyond, given that they are one of the biggest ‘offline’ groups at present. Volunteers help people to explore what the web and digital technology can offer them, whether this is the chance to keep in touch with family and friends, online shopping, news, information and entertainment and new activities. We are also keen to recruit ‘one to one’ helpers for people with additional needs such as Dementia, making use of the internet to enable the person to reconnect with the things they are interested in. confidence in utilising the benefits of the internet and technology and able to encourage and give confidence to others to do so. readiness to assist directly where the person requires this due to effects of their condition e.g.Dementia whilst involving them as much as possible. good interpersonal skills and ability to work with people from a variety of cultural and social backgrounds. assist clients to find information, participate with others and pursue personal interests and help them to register for services where appropriate. help in using associated technology e.g. a printer, digital camera, MP3 etc. assist in the practical arrangements for each club session, updating laptops/tablets etc. If you tick all the boxes below, then please do get in touch. basic knowledge of working with a computer/tablet is essential (email, Internet) and preferably skills, or the confidence to develop them in e.g. Skype, social networking, digital photography and other relevant areas. Equally important is an ability to communicate with people in a calm, patient manner and a desire to improve the well being of older people and others using the service. we ask for a volunteer commitment of 2 hours per week for a 12 month period. Group, ‘club’ and individual sessions are run during the day throughout the year apart from July. We can never have too many Volunteers! we offer an initial taster period (around four sessions) where you would shadow an experienced volunteer. In addition, induction and on-going training will cover teaching and learning resources, setting up equipment, health and safety etc. ‘On the job’ support and supervision from the Club Facilitator will help you with the challenges faced in delivering the service, working with older people and your own development needs. we run clubs in sheltered housing complexes in Edinburgh (Bruntsfield, Colinton, Grange and Leith). As a volunteer, you will be working with a significant number of older people with additional needs and in receipt of care/support services, so you will need to apply to be a member of the Protection of Vulnerable Groups (PVG) scheme or get an ‘update’ if you’re already a member. We will arrange for you to complete the necessary application form and send it off for you. Please note that there is no cost to you. We also ask for two references. If you are interested in joining us as a volunteer please complete the online application form (Google Docs file) or fill in the form, on the right of this page, for more information. Once we have your application, we will arrange to meet, with you, for an informal chat and progress from there. Tap into IT Where You Are has full Public Liability Insurance for volunteers. I have been volunteering for a short while (since August) but have found the whole experience very enjoyable and rewarding. I would urge you to give it a go. I have my own IT Repairs business and this allows me to give something back to those who need digital help. It helps me keep up to date with digital changes too – you learn a new thing each week through helping other people. The clients all have interesting stories and are very appreciative of the help that we give them.